NEWLY-RENOVATED! Housed in the stunning 1921 Humble Oil Building, Residence Inn Houston Downtown/Convention Center mixes historic charm with modern style. Step into our redesigned suites and enjoy the comfort and convenience of complimentary Wi-Fi, separate spaces to work, dine and dream, and fully equipped kitchens with stainless-steel appliances. Start the day satisfied with our free hot breakfast buffet, then return on select evenings for our free RI Mix featuring apps and drinks (Mon-Wed). When it's time to take the fun off site, head to Minute Maid Park, Toyota Center and the Theater District -- all walking distance from our Houston hotel. George R. Brown Convention Center is also just a 10-minute walk away, making business travel a breeze. After a long day, cool off from the Texas heat by taking a dip in our outdoor pool, or burn off leftover energy in our state-of-the-art fitness center. Ready to see for yourself? 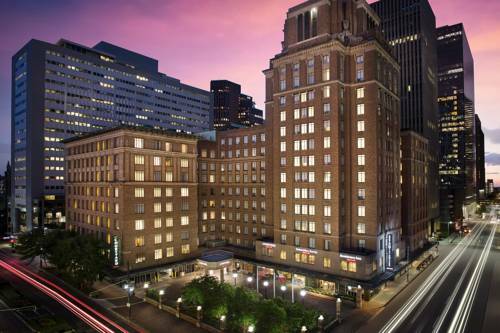 Book today and see why we're one of the top hotels in Downtown Houston! Our downtown Houston hotel serves a freshly-prepared complimentary hot breakfast buffet daily in our lobby dining area. Buffet offers a wide variety of options such as healthy yogurt, hearty oatmeal, indulgent Belgian waffles and much more.